I thought of this moment in an early scene in which Mr. Mosely, who has seen his fair share of troubles, confides to another servant that “I’ve come down in the world,” and we all know what he is talking about. Hey, we have all been there. 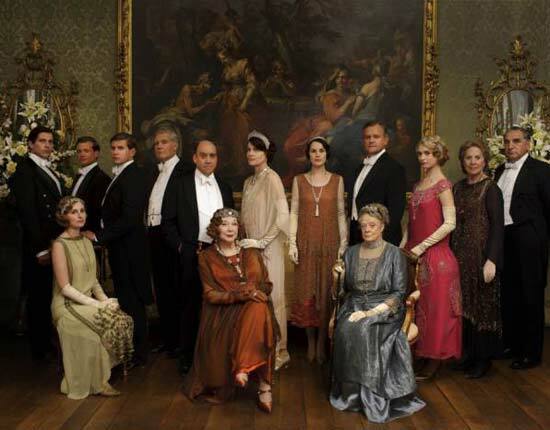 This is the great theme of Downton Abbey: upward and downward mobility. It is a tough gig, requiring a striving that may not have even been possible in previous centuries. English culture is still stratified, but it has loosened. But America has always been a little revolutionary: I am teaching early American literature right now, and whenever I am watching this show, important notions ring in my ears. I think of John Smith telling early Virginians: Hey, if you don’t work, you don’t eat. I think of Benjamin Franklin, in his essay addressing those who “wish to remove” to the colonies, breaking the news that your la-dee-dah title does not count for much. Instead, he tells his readers that in the colonies, it is not so much who you are, but what you do, that really counts. This is what makes America different from any other nation on this earth. We may not always meet our ideals, but at least we have them. We believe that merit should count for something, over titles, over pedigrees, over everything. Sometimes we make mistakes and don’t acknowledge merit where it should be acknowledged, but at least it is a possibility. At least you don’t have to sit around wishing you had been born a dowager to get anything done. Here, you can throw a charity function even if you are not Lady Grantham. You can do it even if you don’t have a swarm of servants at the ready for flower arranging and champagne distribution. You can do it anyway, even if it isn’t how she would do it. In the world of Downton Abbey, you can be like Tom and marry up into the world of Sybil Grantham, forever privileged, even if forever uncomfortable. In the world of Downton Abbey, you can be a Paris Hilton aristocrat and Marie Antoinette it up and play games with a jazz singer of another race, just because you can. But, as she seems to be playing him, it does not necessarily make it right. As Lady Mary reminds the viewer, it is not even the issue of race that weighs on her: it is the fact that he is a singer, a profession beneath the dignity of the Grantham family. Thank goodness Lady Mary sees that Rose is sort of using him to get back at her mother and the larger restrictions of British society. Even she can see that no one likes to be used up and thrown away–a fate that Rose could easily bestow upon the handsome singer. However, that does not take away the poignancy of Jack telling Mary that he will not marry Rose so that he “will not ruin her life.” Indeed, we are reminded of the injustices regarding race and class in British society at that time through that one single line. Rose was “shopping”–but for a boyfriend, and I guess he was not of an “acceptable” race. As Lady Mary said, “Oh Golly.” And that is what we should say, but not about his race, for we don’t choose our race. But “Oh Golly” about the whole shebang of acceptance and dismissal that is the fuel on which this entire show must run. The writers are right to remind us of how wrong these things are. In other news, Edith wants to keep her baby, but then thinks she will have it raised by a local farmer so she can stay in the child’s life. Her aristocratic aunt thinks this is a terrible idea. No need to compromise one’s status if you can take a tour of Switzerland. This is the drumbeat of class and privilege that reverberates throughout this series: the minute I get all excited that privileged aristocrats might figure out a way to manage another baby with so many servants and all, then I am hit with their shallow preoccupations with respectability, which often inconveniently interfere with just doing the morally right, and sensible, thing. This episode, I have to say, must go to the lower classes, who trump everyone with their insights, insights that they have somehow managed to muster without Oxford or Cambridge or even really fancy clothes. Tom, who although good-looking usually irritates the heck out of me, comes through like a champ when her tells a fellow quasi-socialist: “I don’t believe in types. I believe in people.” Good for him. But maybe my favorite moment is when a super thick aristocrat steps in it, but recovers in a totally authentic way when upon hearing of Matthew Crawley’s tragic death, tells his mother, “I am so sorry. For a moment I forgot who you were.” Maybe that is the theme of tonight’s episode: forgetting who one “is” socially or professionally, and just focusing on that person as a human being. That might be the right way to go. And just because it has just been Valentine’s Day, I guess the writers thought that is no reason to spare us from some kind of break-up. Maybe you have had a parting of the ways recently. I don’t know your story, but if I did, I would probably care about it. Maybe someone has rejected you: maybe it was romantically, just in time to forget about presents on 14 February. Maybe it was just a friend, but it still hurt anyway. Maybe it was professionally, and you did not see it coming. I know: sometimes, it does not matter what form it comes in, it is still something that affects us and those around us. Sometimes, it still feels like someone has broken your heart. Sometimes, it feels like your world has been shattered, without a shiver, without remorse. Sometimes, you cannot even believe it is really happening. But let me tell you what she does: she is kind anyway. I am not sure if this is the right thing to do, but this is what she does on this show I am so addicted to: she gives him a gift and wishes him well. I know it is just a story, but it stays with you anyway. When she and her former beloved depart, one of them says: “This really is good-bye.” Daisy is kind to the person who has rejected her, and so she has already defied all of the class hierarchies of English society, because she has decided to be the bigger person. That does not mean things were handled well. That does not mean the person who rejected her knew what he was doing. But in any case, Daisy, with some crucial help from her father-in-law, did not let it get the best of her. Even Mrs. Patmore was proud of her, and that is really saying something. So even Downton Abbey, with all of its glorious flaws, and its obsession with class hierarchy, can give us pause. Even this show, and its constant reminders that people in power, whether it is economic, social, or even just emotional, can do what they will, even if often we are powerless to counter it, makes us think about why this is the way things are sometimes, and what can be done about it. Yet, through Daisy’s kindness, even this soap opera can teach us something about being in a class by ourselves. Being this kind of person is not the easiest thing to wrap your mind around, because it requires defying everything you know about history, defying everything about what you think your “station” in life might be. Such a state requires you to assess your own merit outside of what everyone else has already decided, and this is important as it is the only assessment that really counts. How delicious that the writers of Downton Abbey chose a kitchen maid, a person of the most modest circumstances, to make us think about how to be in a league of our own. How ironic that the person who maybe invested the most in her love for something, or someone else, ends up being the most generous of all. You make me think like Emerson does (‘merit in corners”), but you make me feel even more. Little correction: Daisy didn’t figure out on her own how to do; she exercised the excellent judgment to rely on the unfailingly excellent advice of Mr. Mason, who really does win the World Cup in Father-in-Lawing. (Mr. Mason is my favorite Downton character, and I can’t bear to have him overlooked.) In any case, your essential point remainis unchanged: the aging, bereft farmer is (one of) the moral center(s) of the fiction. Heidi, you are so right! I changed a phrase of two to reflect your excellent observation….thank you so much. I loved how Ms. Patmore encouraged Daisy after the whole wonderful-Alfred-mess. “If you were my own daughter, I couldn’t be more proud.” I die. Through the episode, I kept being so frustrated because I thought Ms. Patmore was pulling for Ivy–and maybe she was–but she loves Daisy. It was such a reminder that maybe we don’t see love or acceptance or belonging show up the way we hoped, but it’s there.